Somol, Robert and Sarah Whiting. “Notes around the Doppler Effect and Other Moods of Modernism”. 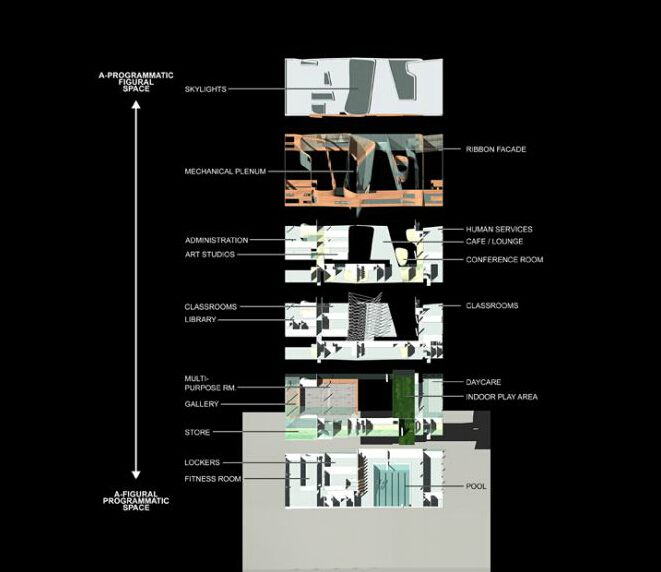 Constructing a New Agenda: Architectural Theory 1993-2009. By Krista Sykes. New York: Princeton Architectural, 2010. 190-203. In their essay “Notes around the Doppler Effect and other Moods of Modernism” Robert Somol and Sarah Whiting summarize their concern about what they label “the now dominant paradigm” by spotting that from their point of view, in recent years “disciplinarity has been absorbed and exhausted by the project of criticality.” In this essay, they are calling for a new approach or an alternative to the critical project, which is the projective architecture. In order to elaborate their argument, they link the critical architecture to indexical, dialectical, and hot representation in comparison with the projective architecture that is associated with diagrammatic, atmospheric (the Doppler Effect) and cool performance. In Michael Hays “Critical Architecture: Between Culture and Form” he wrote: “I shall examine a critical architecture, on resistant to the self-confirming, conciliatory operations of a dominant culture and yet irreducible to a purely formal structure disengaged from the contingencies of place and time”. According to Hays, an exceptional architecture practice situated between “being a cultural product and a discrete autonomous discipline”. However, to Somol and whiting this privileged “betweeness” has become an everyday fact of life nowadays. Therefore, it is necessary to find an alternative to the dominant paradigm of criticality. 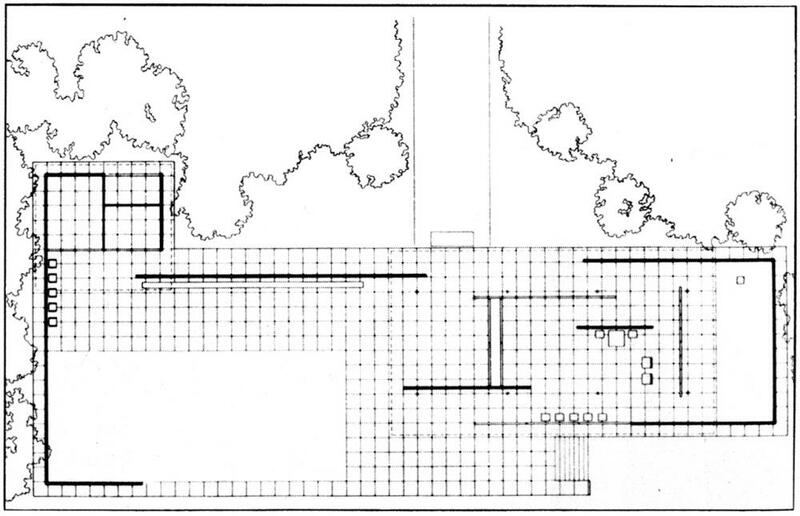 Hays considered Mies’s Barcelona Pavilion as one of the example for critical architecture. The Pavilion “situated itself ‘between the efficient representation of preexisting cultural values and the wholly detached autonomy of an abstract formal system’”. 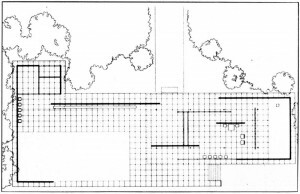 Hays describes the Barcelona Pavilion as “an event with temporal duration, whose actual existence if continually being produced”, or whose meaning is continually being decided. Therefore, the index here is the potential for reproduction. From Eisenman’s point of view, the design process of Le Corb’s Dom-ino’s is the index since Dom-ino was able to function as a self-referential sign. For Hays and Eisenman, both the Dom-ino and Barcelona Pavilion rendered themselves as traces of an event and objects that allows continual transformation and reproduction. 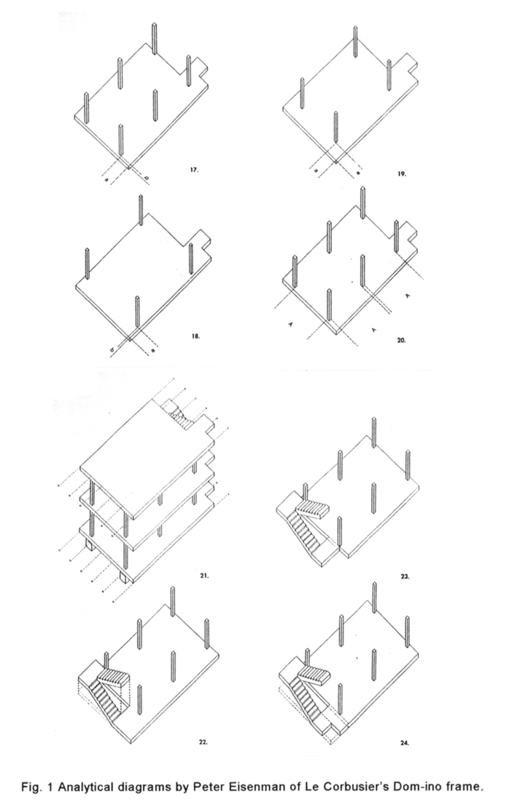 Eisenman has redrawn axonometircs of the Dom-ino at a non-existent perspective; Hays used the historical photographs to describe the experience of the original Barcelona Pavilion. 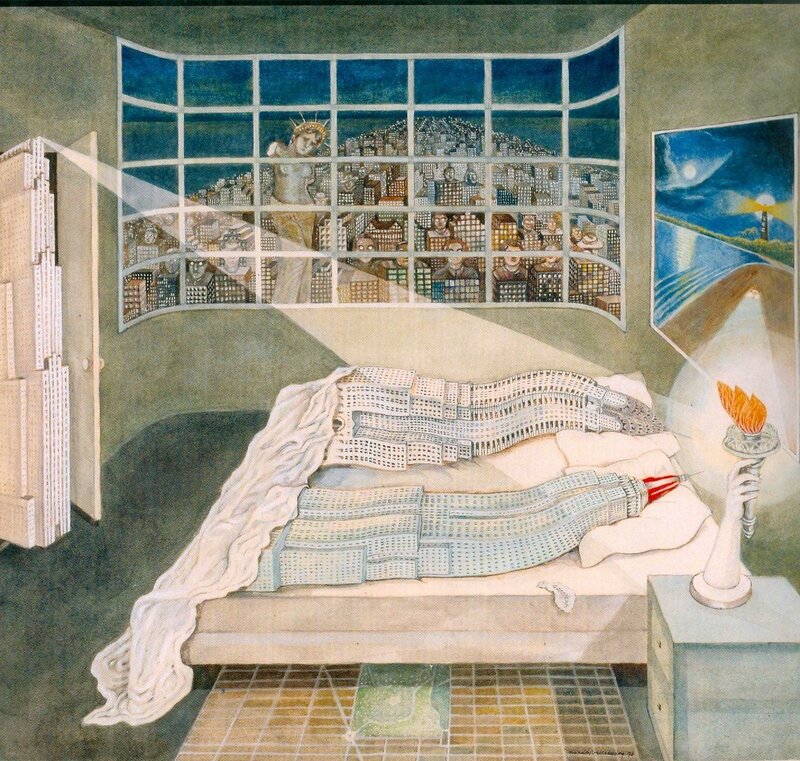 Thus, the authors believed that the critical architecture is inevitably preoccupied by its status as representation, and its simultaneous commentary on that condition. An alternative to the critical-indexical project is Rem Koolhaa’s “cartoon-theorem” and the section cut from Downtown Athletic Club. Instead of being an index, the loosely defined images function more as a projection of virtual world triggering new forms of collectivity. These images are not primarily about architecture, but to prompt new events and behavior. 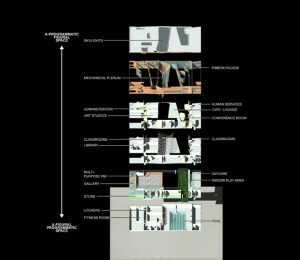 Therefore, Koolhaas’s investigation is diagrammatic rather than indexical here. 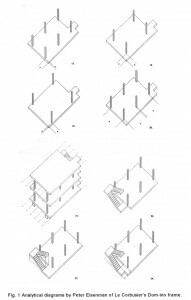 And his diagrammatic approach paves the way for the projective architecture. The projective employs something similar to the Doppler Effect—the perceived change in the frequency of a wave that occurs when the source and receiver of the wave have a relative velocity. The Doppler Effect explains the change in pitch between the sound of a train as it approaches and then moves away from the listener. If critical dialectics emphasizes on architecture’s autonomy, a Doppler architecture focuses on the effect and exchanges of architecture’s inherent multiplicities: material, program, writing, atmosphere, form, technologies, economies, etc. Moreover, since subject and object are equally important in Doppler Effect, the design of Doppler architecture must take into account both the building, context and the participants. Thus, the Doppler shifts the understanding of disciplinarity as autonomy to disciplinarity as performance or practice. One example of projective architecture that adopted the strategy of the Doppler Effect, is the WW’s IntraCenter. The building requires a lot of heterogeneous programs including: daycare, athletic facilities, social services, café, library, computer center, job training facilities, shops, etc. Rather than mapping out all the programs and provide each of them with its formal identification, or establishing a neutral field so as to allow the programs to define the project, the IntraCenter omits the expected overlap between form and program. Their lack of alignment leads to an everlasting Doppler shift between the two. This strategy of non-concentricity generates other Doppler Effects, including the many reverberations among overlapping constituencies as well as material and structural conditions. The IntraCenter is projective rather than critical in that it deliberately sets into motion the possibility of multiple engagements rather than a single articulation of program, technology, or form. 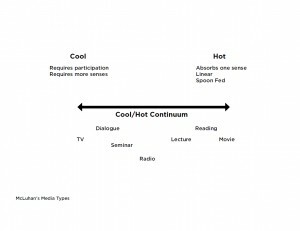 To further elaborate the distinction between critical and projective project, Somol and Whiting characterize the shift from critical to projective modes of disciplinarity as a process of cooling down, by borrowing Marshall McLuhan’s term, of moving from a “hot” to a “cool” version. Marshall Mcluhan, a Canadian philosopher of communication theory and a public intellectual. According to his Media theory, hot media like film are high- definition, communicate very precise information in one mode. 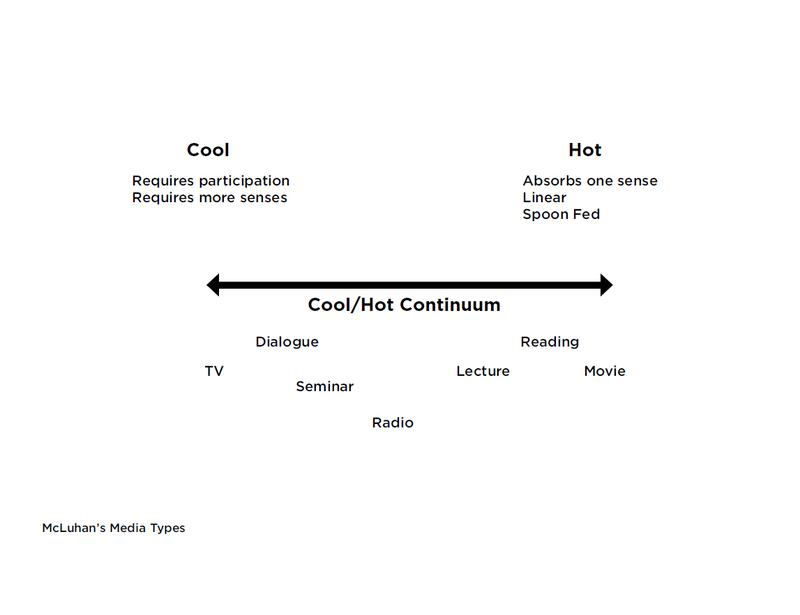 On the contrary, cool media like television are low-definition, they require the participation of the user. Therefore, the critical architecture is hot in the sense that it prioritizes the definition and distinction. The projective architecture is cool because it requires the context and viewer to complete it. Since the critical architecture resists through high-definition, the “hot” associated with it implies the difficult, belabored. In contrast, the cool is easy and relaxed. Furthermore Somol and Whiting amplifies the difference between the cool and the hot by applying the words to the field of performance. They examined two approaches to performance, one represents the hot, and the other illustrates the cool. Robert De Niro was in the former category, which is the school of “Method”. It requires the actor to construct a character out of details and make you believe their character by constructing a narrative for them. Robert Mitchum was in the latter category, where actors create plausibility by their bodies. According to Dave Hickey, they are not really acting, but rather “performing with a vengeance”. The Michum Effect is the projective. It relies on knowing something is back there, but not being sure exactly what it is. The opening scenes of the film Cape Fear in 1991, starts with De Niro working out in prison, exercising and sweating, whereas the original version begins with Mitchum enjoying a cigar and checking out women. Somol and Whiting compare the two types of architecture to these two actors. They argue that the De Niro architecture will be hot, difficult, labored or expresses a relationship of the representation to the real. On the other hand, the Michum architecture is cool, easy and never looks like work. It is about mood or the inhabitation of alternative realities. In conclusion, rather than criticizing the critical project, Somal and Whiting question the dominance of the criticality. They seek to provide an alternative to the dominant paradigm. They proposed a way, characterized as “projective” as a new direction for architecture. They believed that setting out this projective program does not necessarily entail a submission to market forces but rather take advantage of the popular culture and the creativity of the marketplace.